Greenstar Landscapes has earned the reputation as India’s premier Commercial landscape & Residential landscape Consultancy Company. Our quality, creativity and over a decade experience in Landscaping has helped us become India’s most trusted landscaping company. Greenstar Landscapes offers comprehensive commercial landscape services which include landscaping consultancy & landscape design, landscape development & landscape execution, landscape maintenance, seasonal color design & installation and arbor care. With our experienced landscaping team of landscape designers and horticulturists, Greenstar Landscapes can design and build a distinctive outdoor living environment that will give enjoyment for years to come and increase your property value. Whether you are interested in residential landscaping or commercial landscaping, Greenstar Landscapes has the experience, design staff and work crews to meet your needs. Our crews pride themselves on their professional commitment. Most of them are here with us for years and are experienced in all aspects of landscape development, installation and landscaping maintenance. From inception to execution, Greenstar Landscapes provides complete project management. Our drawings are unique to our client requirement designed with due diligence with them keeping in mind their need. 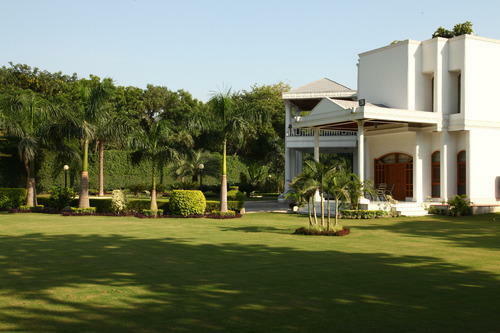 All these factors together made us one of the most respected landscaping organizations around in Delhi-NCR, India. The staff at Greenstar Landscapes looks forward to work with you & your esteemed organization.